Have you ever just taken a moment to, stop, and wonder about the future of the internet? Where is it going? What will happen in 2012? Will Google stay #1 when it comes to search? Can Google + gather enough data to get them back in the social game? Will Facebook release their own rival search engine or mobile phone? Or will Apple’s Siri will spell ‘the end’ of search as we know it? Which ever way you look at it the web as we know it is definately changing. With SEO in particular, we have seen more changes in the last 12 months that we have seen in the last 5 years. I remember a time when Myspace was top dog and people would search using AltaVista or Lycos but those days are now behind us… Google knows this more than most, the web is changing and the only companies to survive will be those who evolve. So what is the future of the internet in 2012? 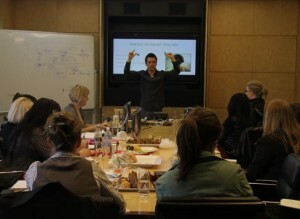 Recently, I was asked to present a full day workshop on the topic for a large corporate here in Australia. Unfortunately, I’m unable to release the recording from this workshop since it was highly tailored to the client and we discussed some pretty sensitive information. That said, I do have something for you. I have put together some snippets from my “future of the internet” presentation… It’s free and my holiday gift to you – you can click here to download it. Take a listen and let me know what you think – post your commments below and be sure to share your predictions for 2012. Do you think I’m on point or just a little crazy? I want to know. Hope you’re having a happy holiday season and I’ll catch you in 2012 and we’ll see which of my predictions come true. Ps. If you, or someone you know, might benefit from our new corporate SEO training – click here to find out more. 1) There is no indication that either the new search alliance or any other online network will rival Google in search or even compromise its market share. 2) Google + is not a play at the social game, it is a play at the SEO game. It is just another way (like Google chrome) to gather a more complete psychographic portrait of internet users. 3) Facebook already, technically, is a search engine. It makes no sense for FB to release a search engine to produce all web results. @Motorator Did you listen to the audio? Looks like we agree on most of the points you mentioned. All except Siri… I think it’ll be closer than you think – Google is already working on their competitor and this technology will evolve quickly. Finally I took a quick read of your article and it didn’t really look like you had taken some of the questions raised in this article – wondering if you linked to the correct article? David, firstly I want to say a big thank you for sharing the information like that. You’re the one of several persons which I’m following to. Right now I’m trying to do some internet stuff in Russia. And I think stuff like social, going mobile, creating a multiple channels of traffic and not focus at just one is a great advices for every time. A bit tired for today, but your podcast open my eyes to some of the cool things. I’m really love the things about the main purpose of creating your own community and focus them straight to your site. As well as I found the socialomics books very interesting and its share some thoughts and “what will be the next big thing” on the web guide to. follow. Downloaded the audio but haven’t had a chance to listen yet. I have one prediction for 2012, and a question regarding local SEO for you. My prediction is that Google+ will become bigger than Facebook, just like Facebook crushed Myspace, and for the same reason — they took note of the good parts, and the bad parts, and improved on the model. For example, one major problem I have always had with Facebook was that my personal and business contacts were all lumped in together, and my friends got my business messages and vice versa. Google solved that with their circles concept, which is simple, but brilliant. Now my question — do you think that having a .com.au domain rather than a .com will get you any brownie points with Google Australia in 2012? Do you think that a .com.au site will rank above a .com site, given similar SEO and backlinks, etc? My gut feeling is no, but recently a self-proclaimed SEO ‘Guru’ from Aus said otherewise, so would appreciate your thoughts! Had a chance to listen to both audios, thanks for the clarification re .com.au sites vs .com. I get your point re Google+ vs Facebook, but I just think sheer weight of numbers will tip the scales in favour of Google. Agreed! Google is definitely gaining momentum and it’s not going anywhere. Will Google stay #1 when it comes to search? – Yes Google will still be the market leader on search but Bing will increase its usage for about 2-4% vs last year. Can Google + gather enough data to get them back in the social game? – Yes, with Google becoming famous on apps, eventually it can pick up but not compete against facebook and twitter. Will Facebook release their own rival search engine or mobile phone? – this is something to consider but not on the foreseeable future. Or will Apple’s Siri will spell ‘the end’ of search as we know it? – We are looking for Google’s version in Android. Thanks for such topic, David.